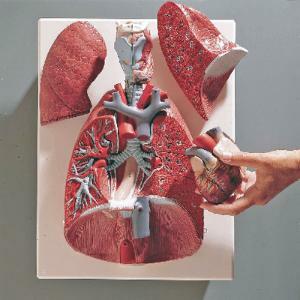 Study all the organs of the throat and chest, from larynx to diaphragm, with one highly detailed model. Remove the two-part dissected larynx, front half of both lungs, and two-part heart for up-close examination. The right lung is sectioned to reveal its inner structures, and the left lung is dissected to show the bronchial tree and pulmonary vessels. Also shown, in the diaphragm, are the esophageal hiatus and aortic hiatus. The model is mounted on a base.